470-WH-DST is rated 3.9 out of 5 by 118. 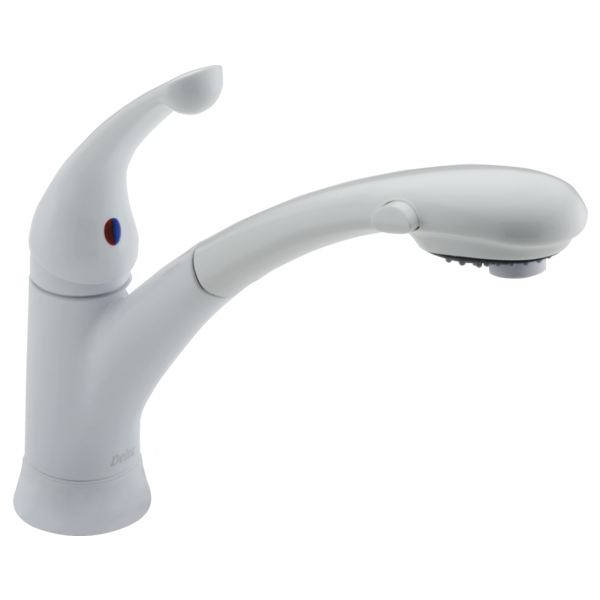 Rated 5 out of 5 by Notaplumber33 from Great customer service I love this faucet, but also the lifetime warranty and customer service that goes with it. Delta has stood behind their products for me multiple times. 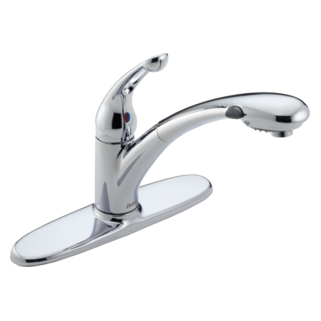 Rated 3 out of 5 by feinuklein51 from replacement I replaced the same faucet, only to find out that this is made cheaply. The pull out I had was stainless steel the new one is plastic. 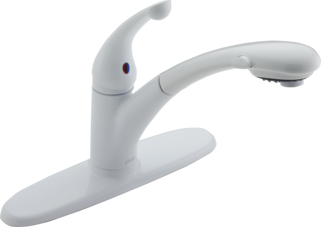 It also feels much flimsier and cheaper than the original faucet. I still like the way it looks and the life time warranty that comes with it. Rated 4 out of 5 by Razel from Great Lifetime Guarantee! This is a replacement of my previous faucet which wasn't working anymore. 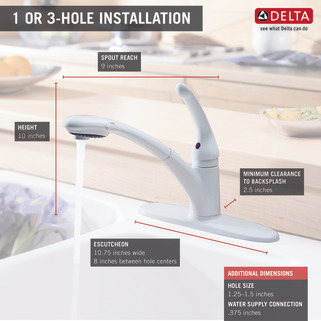 Thankfully, Delta Faucet has a great lifetime guarantee. I'm happy with the model, used to it for almost 30 years. I love the pull out spray handle. Rated 4 out of 5 by Darlene from Easy to use The only feature I wish it had, when you shut off the faucet and you had used the spray, I'd have liked the spray automatically turned off to a regular flow. Rated 4 out of 5 by Thomas from I question the material this product is made of. I have a somewhat opinion of the material this product is made of. Will see if it works well with my daily use. I asked the earlier question about installing w/o the base. Thanks for the response. I noticed that my current faucet has a gasket at the bottom; does the new one come with a new gasket? 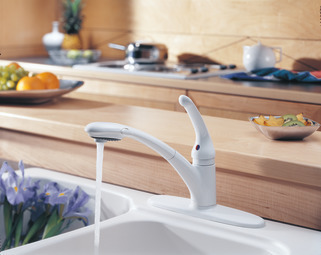 I have a Delta Signature Pull-Out Kitchen faucet (white) installed in 2000. I need to replace the hose assembly (see photo). What should I order? The hose assembly and clip RP74608 and RP44647 do not appear to be the same as what we need replaced. 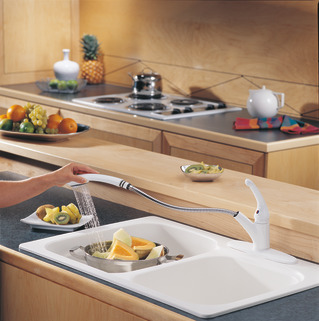 We have a second sink/faucet in our kitchen which we want to match. 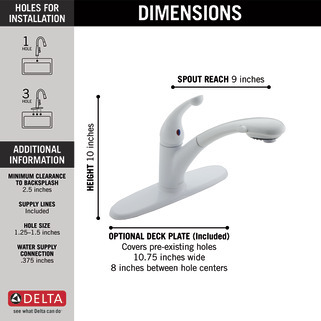 does this faucet have different spray patterns? If you hit that button on the size, does it convert to a different spray pattern? 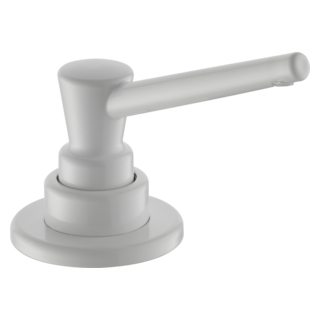 Is the wand in metal or in plastic for the white finish? Can the faucet be installed w/o the base? I have this same faucet w/o the rectangular base. There is no room on the lip of my sink for the base. Will this work or is it offered in a model w/o the base?